I feel that my pottery has taken a turn into a completely new direction this month and It's a long time since I've been this excited about something! Saying that making pottery is a time consuming business really is an understatement. So, anything that speeds up the process has always been a bonus in my eyes. This month however, I've come to the realisation that maybe trying to speed things up isn't really allowing me to get the best out of myself and really reach my potential. So, what's changed? Well, Jen suggested I decorated some plates with some hares and moons. I really liked the idea and began to think about how I could realise the image that was in my head. I knew that what I wanted would be difficult to achieve by painting on glazes - I did a couple of tests and wasn't happy with the results. The thing is I've always been good at drawing (I worked as an illustrator after university), and I wanted to use this skill. So, I decided to apply some brown slip to some white stoneware bowls that I had and then scratch it back to create the image (scgraffito technique). The process is very time consuming. Funny thing is I got so engrossed in what I was producing that I didn't really care. By the time I reached the fourth bowl, several hours later, I'd really refined the design and felt that it was of a good standard (the image below is the first of the 4 bowls - I'll post pictures of the later bowls when they're fired). As I scratched away I really began to feel that this was the beginning of something. Ideas for future designs began to flood my mind. I've been jotting them down in my sketchbook all week. I really can't wait to share them. Jen is trying to restrain my imagination, saying that I should develop the hare and moon design. She's absolutely right of course, but I'm keen to explore all my other ideas too. 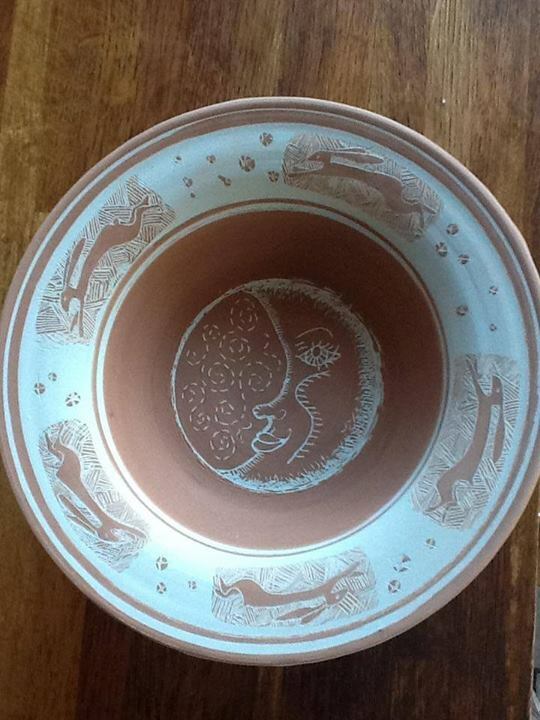 For the time being I'm going to stick with hares and moons, varying the design according to the pot. I'm doing caddies next, and maybe cups and saucers. As for this being a time consuming process, well I've had to factor that into the price of these pots. Maybe they'll sell and maybe they won't, but I just hope that there are people out there who appreciate that a quality hand made item takes time to produce and has an associated cost. I'll try to keep the costs down, I really want people to enjoy these pots as much as I enjoy making them. Keep checking in, there's a lot more to come! This is the first bowl I used the scgraffito technique on. It hasn't been glazed or fired yet. Pictures to come next week.